This webpage is dedicated to common questions sent to us via email and/or private messages about our trade methodology involving our free resources and fee base resources. Also, we highly recommend you join our discussion forum to ask questions at the below link if the info at this FAQs webpage doesn't answer your questions. With that said, we are proud of the fact that we've freely helped hundreds of traders via either improving their knowledge about trading and/or improving their profit level without trying to get them to purchase any of our fee-based materials and without mentioning we are traders/vendors. In addition, we've been online since 2000 and most of our clientele are via word of mouth or Google search engine. Further, we do not advertise our services at other online locations nor do we spam other online locations which is another reason why there's very few discussions about TheStrategyLab.com elsewhere online except for mischaracterization posted by trolls. In fact, a lot of traders are not interested in our services and instead prefer to talk to us about trader psychology, behavior finance, algorithms in today's markets, business aspects of trading. I heavily discuss these topics at other forums and will tell traders to go read my discussions about these topics at other forums instead of me repeating info every single time I'm questioned about such. These types of trader talk will give them a good indication of my professionalism, communication skills, trading tips and ability to understand problems along with providing resolution for many things related to trading without discussing services by TheStrategyLab. In fact, most traders I talk to are not aware that I'm a vendor because I don't advertise to them nor do I bait them into asking questions about my services if they are aware that I'm a vendor. What exactly is TheStrategyLab website or its purpose ? We are an education website and a research/development website for market analysis and trade strategies. Hence the phrase "Lab" in the name TheStrategyLab. Simply, we educate traders about the price action they're trading involving many different trading instruments. To be specific, we help traders to merge our price action analysis called WRB Analysis with their trade signal strategies. Also, some traders request help from us to help them design their own custom trade signal strategies that uses price action concepts from WRB Analysis. We are not programmers or coders although some users of WRB Analysis have merged their own trade methods with WRB Analysis into a proprietary trading system because WRB Analysis involves objective rule base price action definitions. As you can see, the trader must interact with us and discuss how they trade, they must share with us chart examples of their entries/exit (I don't need to know the details of their trade methods) so that we can provide proper support to help them improve the results of their trading and to help them identify problem areas in their trading. They must also share with us their statistical analysis or trade results (simulator or real money) of their trading prior to learning WRB Analysis and after they've learned/applied WRB Analysis. To make it easy for traders to do such in private, we've created a private thread section at our forum for traders to request and then have private interaction with us in their thread so that other users of WRB Analysis does not have access to the private information being discussed. It's in these private threads where the education begins for users of WRB Analysis from all over the world share their statistical analysis, full broker statements, trade methods, trade journal, chart analysis as they slowly merge WRB Analysis with their own trade methods. Unfortunately, most users of WRB Analysis do not request a private thread and/or they do not interact with us while learning WRB Analysis. Traders that do this are defeating the usefulness of WRB Analysis because they will have too much difficulty to merge WRB Analysis with their own trade methods or too much difficulty in designing their own trade methods. Most users of WRB Analysis are only using the WRB Analysis free study guide. In contrast, our fee base clients, most of them are purchasing the Advance WRB Analysis Tutorial Chapters 4 - 12 (more info below about this education content) because they have their own trade methods that's performing poorly or they're barely profitable and they want to use price action concepts from the advance WRB Analysis to improve the performance of their trade methods. In comparison, only a small percentage of WRB Analysis users purchase our Volatility Trading Report (VTR) advance trade strategies (more info below about this education content) that's already merged with WRB Analysis. Is there a way to determine the reliability or usefulness of the strategies prior to purchasing the strategies? Yes...we offer free resources for you to review and then apply to determine the usefulness of WRB Analysis @ WRB Analysis free Study Guide (analysis) and Volatility Breakouts @ Fading Volatility Breakouts. The WRB Analysis free study guide is designed to help improve the performance of your own trade strategies and/or your understanding of the price action you're trading so that you'll make better trade decisions. In contrast, if you don't have a trade strategy, you can use our Fading Volatility Breakouts strategy with the WRB Analysis study guide so that you'll see how we merged a trade signal strategy with WRB Analysis. This is an important step in the free resources so that you can do your own due diligence and learn how to merge your own trade signal strategies with WRB Analysis. Most users of WRB Analysis have determined that WRB Analysis is useful. They use its price action concepts either in their entry signal, exit signal, trade management (stop loss, trailing stop), profit target, trend analysis, range analysis or volatility analysis. Yet, we have no problems in admitting that some users did not see an improvement in their trading. Therefore, if you're going to use our education content, you'll be required to learn and apply the WRB Analysis free study guide prior to the purchase of any of our fee base education content because WRB Analysis gives that critical "understanding of the price action" that's called market context to help minimize losses and maximize profits along with giving you the due diligence. In addition, you're required to document your learning and application of WRB Analysis as described in the next question. To prevent any misunderstandings, the free Fading Volatility Breakout (FVB) trade signal strategy is not a trade strategy I use often but some of the price action concepts from the FVB strategy I do use every trading day. The FVB trade signal strategy is for traders to see how I merge WRB Analysis with a trade signal. The FVB strategy then gives the user ideas involving how he/she can merge WRB Analysis with their own trade signal strategies and/or how to design an objective rule-base trade method. In addition, the other purpose of the FVB trade strategy is for traders to see my communication skills and support so that they can determine if interacting with TheStrategyLab (e.g. wrbtrader) is suitable for them. You require users of WRB Analysis to document their learning, application of WRB Analysis that includes the minimum of keeping details such as date, timestamps of entries/exits, chart time frame used on each trade, position size and the reason (WRB Analysis) for the trade...why ? Yes...its a requirement. Actually, any trader that talks about the importance of backtesting, its a trader that's already doing such. In fact, traders that do not document their trading on a simulator and then do not document their trading via real money trading...they are traders I can not help with their trading and their discussions tend to be more about their "feelings" about the price action instead of discussions with any facts. More importantly, they are traders that can not help themselves. Therefore, if you see someone that say something works or does not work and they're unable to provide you with any type of documentation as the above for verification...their commentary is just hearsay (rumor or without truth) especially if they're someone that you've already seen them talk about the importance of backtesting or they say they've "tested" the method. Regardless, the requirement for users of WRB Analysis to document their learning and application of WRB Analysis is too allow me to provide proper support and for me to provide custom support that's specific to that trader. I only do this because I've personally visited traders in their homes while they were trading and I immediately notice they were moving from trade to trade without properly documenting their trading. I would then ask them about trades in the recent past and they were unable to give a reason for any particular trade except show how much profit or loss involving a particular trade. I then came to the conclusion that there's too much cliché in the talk about backtesting and traders can not provide any statistical results via their own application nor provide any specific details about entry signal, exit signal, trade management, reasons for the trade or market context of the trading day of the trades. Seriously, backtesting is important and forward testing is arguably more important. Therefore, do not become one of those traders that talks about the importance of having a trading plan and doing backtesting, forward testing or simulator but that has no verification they've actually did such especially if you want to learn WRB Analysis to improve your trading. Traders that do not maintain backtest results of WRB Analysis or do not maintain statistical analysis of their own trading involving WRB Analysis...their trading will be consistently problematic. For example, if a trader can not tell me the percentage of trades that reached WRB pt1 versus WRB pt2 versus WRB pt3...its a big problem. Another example, if a trader can not tell me the WRB Zone they used for each trade...its a big problem. Simply, I want to avoid working with traders that do not or refuse to properly document their learning and application of WRB Analysis or any other method including their own custom trading system. Another way to look at it, vendors should scrutinize whom they work with and have something in place to help them determine which trader is willing to do the work to succeed because profitable trading involves much more than following a trade strategy. I go into details about variables that are more important that trade setups in my "daily trading routine" that's posted in my performance record. Do you post your full brokerage statements? In contrast, current statements by clients are only posted in their private threads due to security reasons after problems with hack attempts on their brokerage accounts. Yet, some clients still post their broker statements in the public outside of TheStrategyLab (you must be a register member of our forum to request the location of these public statements outside of TheStrategyLab website). Regardless, brokerage statements are not an indication if WRB Analysis will work or not work for you. Heck, you can be sitting side by side next to me in person and watch me trade with your own two eyes...it will only prove I do trade but it will not give you any indication for your future performance. You can only get that indication from your use of the WRB Analysis free study guide via comparing your trade results before learning WRB Analysis versus your trade results after learning/applying WRB Analysis. Yet, whatever indication you find...there's still no guarantee it will be your future performance because markets are always changing due to changes such as low volatility to high volatility, high volatility to low volatility, trend to range, range to trend, global economics, changes in exchange rules, changes in technology and changes in your own personal lives that will have arguably the most impact on your trading. Do you show your losing trades and losing trading days? Yes. I do show my trade losses in the free chat room and in my brokerage statements. In addition, I discuss the reasons for those losing trades or losing trading days only in the free chat room but I only discuss the specific details of the trade strategy used in the losing trade via private message with fee-base clients...if another trader ask questions about the losing trade. Most of the time its just my wrong analysis or poor trade management after trade entry or simple trade errors in opening/closing a trade in the trade execution platform. Thus, we all have bad trading days and I have no problem in discussing my own bad trading day as it occurs in real-time. Simply, I believe that discussing losing trades are just as educational in discussion profitable trades on any given trading day especially in real-time as it occurs. In fact, I highly encourage other traders to do the same in the chat room or via their private trade journal because it helps to identify the problem so that it can be minimize or prevented in the next trade. Do you allow traders to have access to your depth of market (DOM) window via screen sharing in real-time while you're trading or do you have any recorded videos of your depth of market (DOM) while you traded ? First of all, this particular question is usually aimed at someone that has a signal calling trading room service or a mentoring service. I do not offer those types of services and I've never had such services. More importantly, I do not allow someone to mimic (copy) my trades and I've never allowed such. Typically, those that ask for access to my DOM window are attempting to mimic my trades without my permission or attempting to use such as a signal calling service. Just as importantly, I'm not a DOM trader although I've tried it a few times in the past and have even documented (with images) my DOM use many times. Regardless, even though you can see the DOM in the image at the above link...I don't use bid/ask information, price ladders or market depth when I'm trading to determine my trade decisions. Simply, my trade execution window (order pane) is my primary route to execute my trades because I'm able to minimize my trade errors when I don't watch the DOM. 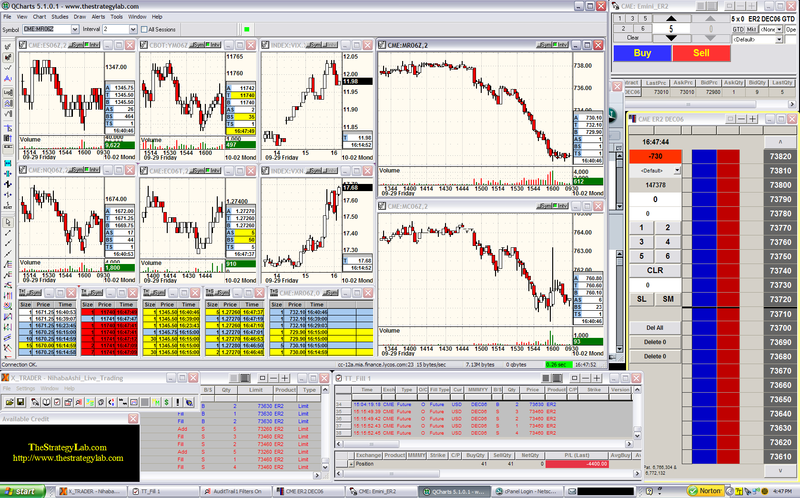 In fact, I now keep my market depth window minimized down in my task bar so that I do not see it. Today's markets are heavily occupied by algorithms that constantly cancel trade orders. Thus, the info you see in your depth of market (DOM)...50% to 85% (depending on the trading instrument) is a false representation of changes in supply/demand. Therefore, be careful with trade decisions dependent upon information in the DOM. Secondly, I don't sit at my computer the entire market day and that's another reason why I don't offer a signal calling trading room beyond saying I trade actively on most days the first two hours of the regular trading session. With that said, I do plan on doing recorded videos of trades with explanations of the trades via the price action concepts from the WRB Analysis free study guide. Yet, these videos will not contain any recordings of my DOM window or market depth window considering I do not use such. In contrast, you will only be able to see the trade order pane screen for my trade executions (entry/exit), a few of my charts and the free chat room window that includes my posting of the confirmed trades in the free chat room. Yet, you will not be able to see all my other screens because I use a multi-monitor setup. These videos will initially only be available to active users of the chat room or active users of the forum. I may even add hindsight audio to the recorded real-time videos to make them more educational about the WRB Analysis free study guide. Your website is an education website. Why do you not offer a signal calling chat service or a mentoring service ? I am not a fan of signal calling services. I've learned enough about them that the only way users can profit is if the trades are called far in advance. The typical trader isn't able to profit from such because the price action often changes after the trade was called in advance. In contrast, trades called in real-time (not in advance), I've learned (study) behavior finance and cognitive reactions to know that traders can not react fast enough to get similar like fills when they try to mimic (copy) trades by others. Further, I do not have the time and energy to manage such a service. Also, although I post my trades in real-time in a free chat room, I do not want other traders trying to mimic my trades because of the above explanation and that's why the free chat room is not setup as a signal calling chat room. This is why I require users of WRB Analysis to document their learning/application of WRB Analysis and to post lots of "demonstration of knowledge (DOK) because they will be a useful tools if I were to start a mentoring program. In fact, if I do mentor, I will not mentor anyone if they can not provide me with any documentation of their learning/application of WRB Analysis. Simply, I need to know what they understand and verification of such. Your website has many positive reviews in different languages and lots of positive testimonials from traders around the world and only one negative review. Can you explain the one negative review and explain why some users didn't find WRB Analysis useful while most users say its useful ? I have a lot of satisfy users of WRB Analysis that have an improvement in their trading and a small percentage of users that did not see an improvement in their trading. Simply, there are traders out there that WRB Analysis can not help. That's normal and there's no such thing as perfection and I make no guarantees. In addition, I do not know how many of the dissatisfied users are incorrectly using WRB Analysis considering they tend to not document their learning and application of WRB Analysis. Further, I do not know how many of the dissatisfied users are missing other key variables that's needed for successful trading such as discipline, stress management, proper margin/leverage use, proper trading instrument, proper trading environment, proper capitalization and many other aspects that's critical for successful trading. I have heard complaints by a small group of fee base clients that say WRB Analysis is confusing. Unfortunately, most of them did not follow the designated Learning/Application Route of Tutorials and Trade Signals that's posted in their private threads and I saw too many errors by them in their demonstration of knowledge (DOKs). Also, as noted in an earlier question, all users of WRB Analysis (free users and fee base clients) are required to document their learning and then trading on simulator prior to any real money trading. That documentation requires them to keep information such as the date of the trades, timestamps of entries/exits, chart time frame, position size management and reasons (WRB Analysis) for the trade. This is the minimum information that anyone doing backtesting would keep. Unfortunately, the requirements are ignored and that makes it impossible for me to help any trader struggling or confused by WRB Analysis. Also, be very careful about the negative opinions out there because most of the negative opinions you've seen were posted by traders we've already had banned from our website resources because they had either harassed other members, harassed us, impersonating members in an attempt to gain access to services they did not pay for, impersonating other members that had already given us a positive testimonial, hack attempts on trading accounts or they are upset I banned them from the free chat room for their disruptive and trolling behavior in the chat room. More importantly, the one negative review you saw by a blogger...he did not use WRB Analysis and refused to view my archives of my real-time trades, refused to view archives of real-time WRB Analysis, refuse to view my broker PnL statements and refuse to review clients full brokerage statements. Instead, he wanted access to my trading accounts while not disclosing to me in our conversation that he's a convicted felon that defrauded his victims over 16 million dollars...ruining their lives. Seriously, if you think my denying him access to my trading accounts is unreasonable. 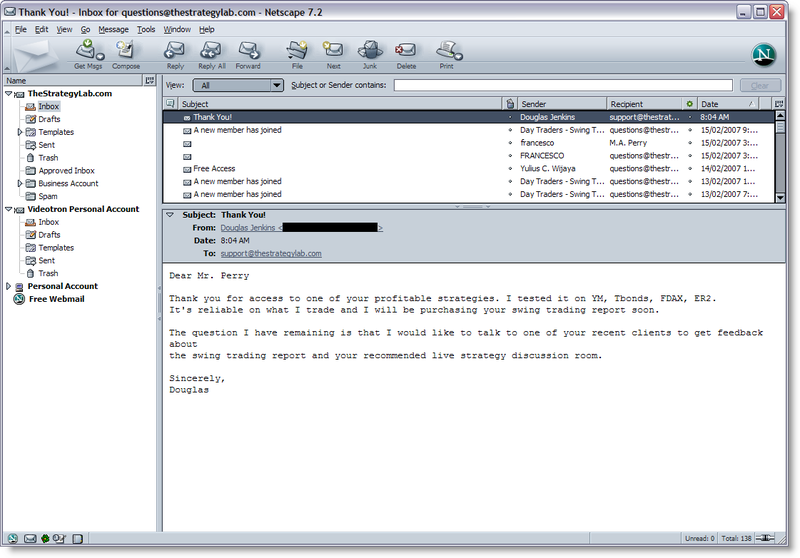 You're more than welcome to contact him and share your trading accounts or any other private information with him. Good luck with that considering he's someone that had access to private information about his clients and then decided to defraud them in the tune of +16 million dollars resulting him in being sent to prison. If you think my real-time trades are fake, my broker PnL statements are fake, clients full brokerage statements are fake, users documented real-time trades are fake, positive testimonials (accolades) are fake, users statistical analysis of my methods are fake, users statistical analysis of their own trade methods merged with WRB Analysis are fake...stop reading this FAQs and go hang out with that convicted felon and ask him to share with you his real-time trades, full brokerage statements and DOM (if he uses it) considering he's a trader and vendor too. The real issue is this. I do not tolerate individuals being unprofessional, bullying, intimidating, harassing, trolling or engaging in targeting abuse of users of WRB Analysis or to myself especially those that try incite others to do the same. I hold them accountable for such behavior via banning them. Also, I stop sharing any useful trading education content with them. In addition, I maintain a digital documentation of such behavior for future reference. Unfortunately, they choose to retaliate after being banned via going elsewhere to post negative comments under the umbrella of false statements that you've seen about TheStrategyLab. Their only truth is that I refuse to share private information about my trading and myself beyond any information I've already shared. Ironically, some of them did share their brokerage statements and/or positive reviews about WRB Analysis prior to being banned. What exactly is the demonstration of knowledge (DOKs) and why is it so important ? DOKs requires users of WRB Analysis to learn the education content and then prove they've understood and can identify the price action concepts on hindsight charts...essentially the trader uses the DOK to pretend he/she is teaching the reader about the price action concept. Thus, DOKs allows me to see where the user of WRB Analysis is at in his/her learning/application route so that I can determine if they're correctly following the instructions in the learning/application route. More importantly, DOKs allows me to tell the user of WRB Analysis if they've correctly understood the price action concepts. Essentially, the DOKs ensures the user of WRB Analysis will receive proper support if/when they become confused about any price action concept. Therefore, the DOKs are critically important in the communication between the user of WRB Analysis with myself and other users that can help. Simply, a user of WRB Analysis that does not post DOKs or consistently posts incorrect DOKs or skips around in the learning/application route instead of following the designated instructions or begins trading with real money without the required 30 day minimum simulator phase to help them traverse from hindsight chart learning to real-time streaming application...these small group of traders will often be confused, complain the most and argue the most. You can review examples of simple DOKs @ http://www.thestrategylab.com/tsl/forum/viewforum.php?f=61 (DOKs from fee base clients involving the fee base education content is not shared with none clients). You're a member of several popular trading forums. Yet, you do not discuss your trade method at those forums and you do not mention your services. Therefore, why do you use those forums...do you have a hidden agenda ? I have several close personal friends (retail traders, institutional traders and former institutional traders) that are members of those forums that I communicate mainly with in private message. Yet, my public messages at those forums tend to involve trader psychology or debating with traders that are hypocrites in their views about technical analysis when I know for fact they use technical analysis. In addition, I will often talk general market discussions that has nothing to do with my services at TheStrategyLab (e.g. wall street, quantum computing, algorithms, charting software, sports, hobbies and so on). In addition, I just want a presence at those particular forums via my username wrbtrader because I wanted to secure my user name after I had some problems with traders I banned from my website many years ago. What's the difference between mentoring and your free resources or fee base resources ? As stated, we currently do not mentor and the main difference you've asked about is that mentoring can only be properly perform in person to increase the odds dramatically that a student will have the tools to be a successful trader which is why most mentoring fails miserably because most mentors do it via online (e.g. chat room, weekend seminar et cetera). In contrast, our free resources and fee-base resources are like building blocks that must occur prior to any in person mentoring which is why many of the users of WRB Analysis are waiting for us to start a mentoring service to continue improving their trading. Just as importantly, mentoring is teaching someone how to trade and if you read the WRB Analysis free study guide...the free study guide does not teach you how to trade. Instead, the free study guide explains some of the price action concepts that I use while trading. Simply, all we do is sell our strategies that we use to achieve the trading results you see posted in the free chat room called ##TheStrategyLab although we do not market our strategies in the free chat room because it is a SPAM FREE chat room via request of those that use the room. In addition, your purchase entitles you to get support that's critical to the learning process of your trading. This support allows you to ask trading related questions involving our strategies and your trading instruments along with discussing with you real-time patterns from our strategies in the private chat strategy discussion chat room called ##VolatilityTradingTSL or ##WRB_Analysis and via private message on Skype, twitter or stocktwits. I mainly use twitter and stocktwits via private message. Thus, you may not see a lot of public messages by my user name wrbtrader on those social media services but I'm very active on those social media services via private message. To read about our personal opinion about how we define mentoring (coaching)...click here. You post recent chart examples @ StockTwits @ TSL Support Forum of your trade strategies...are those trades you've taken ? Those charts at twitter, stocktwits and the TSL Support Forum do not represent trades by TheStrategyLab itself. In contrast, the charts represent trades by some of the free users or fee base clients that used the concepts discussed in the WRB Analysis Tutorials or our trade strategies to make those trades (simulator or real money). To be more specific, if you contact me and discuss the details of a particular trade in which you used price action concepts from WRB Analysis...I will document the conversation and download a chart of price action for possible use for marketing/advertising at my own website or on twitter or stocktwits. the charts presents trades in key price action or trades that exemplify an illustration of one or several concepts from WRB Analysis. As for the trades of TheStrategyLab.com, you can review our performance record @ http://www.thestrategylab.com/tsl/forum/viewforum.php?f=147 for details about each trading day even though there are no charts included in our performance record. There are different fee-based services associated with a different forum. How do I know which forum to join after payment ? Upon payment, if you have not registered for a forum, we will contact you with instructions to ensure you'll join the correct forum. However, if you join a fee-base forum prior to payment, your registration goes into a "verification status" prior to allowing you access to the fee-based contents posted at the forum. It will stay in the "verification status" for 72 hours until payment is received. In the verification process, you will be asked questions that you must respond to with answers. One such question will involve asking if you downloaded, learned the WRB Analysis free study guide and if it was useful to your trading because you're required to have used the WRB Analysis free study guide for your due diligence prior to purchase. Your broker profit/loss blotters that you show for the past few years show that you are a profitable trader. Therefore, why do you bother selling your strategies ? We have learned many things from our free users and fee base clients that have helped improve our own trading and some clients have become excellent traders themselves via our methods that we actually help each other during the trading day via the private strategy discussion chat rooms, skype associated with the fee-based strategies. I'm not a lone wolf type of trader that wants to trade alone without any real-time communication with other traders during the trading day. Therefore, I prefer to communicate with other traders during the trading day. In fact, I want my communication to be with traders that understand the basics of WRB Analysis or understand other aspects of trading that's critical to my trading such as behavior finance, trader psychology and such. Without that communication, the trading results you see will have been less. Simply, the free resources and fee-based strategies and have open the door to real-time market collaboration with other traders around the world that improves the trading of all those that have walked through TheStrategyLab.com doors via a vested financial interest that produces dividends for us and our clients. This type of trading collaboration with other traders using concepts from our WRB Analysis easily increases the odds for us to be able to consistently exploit the markets. 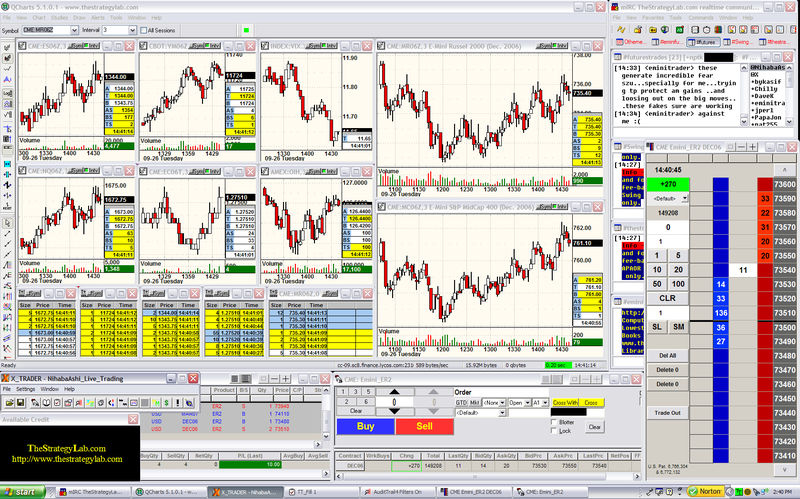 In addition, our marketing and payments made to TheStrategyLab.com usually occurs before or after trading hours. Thus, the hours designated for managing the website does not interfere with our trading. Therefore, if selling the trade methods interferes with our own trading results...we would stop being vendors as a second source of income. Just as important, the income from our website is a small dollar amount due to us not having the time to market ourselves outside of TheStrategyLab. Do you have a refund policy ? Simply, we expect you to do your due diligence via using our free resources prior to you purchasing any of our fee-base resources so that you'll know exactly what you're getting. If you have any questions about our no refund policy...please do not hesitate to contact us. How long would it take to become consistently profitable after purchasing your strategies or using your free resources ? It's impossible to answer this particular question because we don't know anything about you as a trader via many variables that deals with a trader's learning abilities, market experience, discipline level, ability to handle stressful trading conditions, home/office trading environment, issues within your personal life, changes in market conditions et cetera. In addition, as a reminder, our goal is to make you a better trader in comparison to your trading prior to your purchase of our fee-base resources...a goal that most of our clients achieve. Do your strategies involve technical indicators (e.g. macd) ? No...we are price action only traders that do not use technical indicators but we do use technical analysis and basic understanding of the impact of key market events on the markets. Also, some users of WRB Analysis do use price action concepts from WRB Analysis merged with their indicators or proprietary trading systems. Are your Volatility Trading Report (VTR) trade signal strategies or the free Fading Volatility Breakout (FVB) trade signal strategy applicable to all markets ? Our trade signal strategies are not applicable to every market because we are a strong believer that vendors should only market their services to trading instruments they currently trade, traded profitably in the past or have clients that are currently applying the trade methodology to particular trading instruments. To see the complete list of trading instruments that's applicable for trading via your strategies...click here. In contrast, our WRB Analysis Tutorial Chapters are applicable to all markets (stocks, futures, exchange traded funds and forex currencies) that you're able to see WRBs and WRB Hidden GAPs. Can you explain exactly what is WRB Analysis and how its beneficial to trading ? The word WRB means wide range body (candlestick chart clients) or wide range bar (bar chart clients) and there are different types of WRBs based upon either...[continue reading]. Are the trade signal strategies subjective or objective ? All of our trade signal strategies have a well-defined trading plan (objective). Simply, you'll know the rules (not computer codes) for the pattern signal, confirmation signal, entry signal, initial stop/loss protection, trailing stops and when to exit a profitable trade. Yet, our trade signal strategies is not a mechanical system and that in itself implies it's a discretionary rule base trading method. Simply, objective rule base trade method but discretionary application due to traders (users) are different in comparison to another trader. With that said, some users have coded the tutorial chapters and some of the advance trade signal strategies into their own proprietary trading systems...usually merged with their own custom methods. That in itself should tell you its not subjective because if it was...they would not be able to do what they did. These strategies are a rule based method with no subjectivity in the pattern signal nor entry signal...can the strategies be coded for mechanical or automated trading (computer trades the method while the trader is doing other things)? We ourselves are not programmers and were unable to code the strategies for automation trading. Yet, you can download the WRB Analysis free study guide to see if you can program/code it yourself as some users have already done such. Some locations of these codes are posted in the WRB Analysis free study guide and our free Fading Volatility Breakout (FVB) trade signal strategy while other codes are private and only posted by the trader in his/her private thread because its merged with their own proprietary trade methods. The ##TheStrategyLab trade log sometimes show you stating a particular trade is via intuition. What exactly does that imply considering your strategies are not subjective ? I take trades via my well-defined strategies and intuition trades based upon my experience in specific types of market conditions. I'm upfront about any trade I state is intuition versus other trades that are not intuition. Yet, all trades share a tick with a WRB Zone as required in the WRB Analysis education content. There are some trolls intentionally posting misinformation about my intuition trades. For example, if I take 10 trades and 2 of the 10 trades were announced as intuition on entry into the trade...users of the free chat room do not get an explanation when the ask me to explain the intuition because my response is that its just "trade experience". Unfortunately, some of these traders that later become trolls...they will post misinformation elsewhere that my trades are confusing to them and it doesn't correlate with what they've learned from WRB Analysis. Reality, if you read the archive chat logs of the free chat room, I often talk about the market does what it does and it does not depend on technical analysis or some quantitative reason. I'm able to exploit some of those situations via intuition. Yet, for some odd reason...its disturbing to some traders and they're very confused about intuition trading and then they feel the need to bad mouth it because they're not able to do it too. Intuition trades are mainly trades where I'm not following my own rules due to the fact I may be designing a new strategy, trying a new trade management approach or relying on my market experience when I don't have trade signals from my the objective strategies but I do understand why the market is doing what it is doing. Yet, as stated, all my trades shared a tick with a WRB Zone as taught in WRB Analysis. Further, I keep separate trade result stats of my objective trades versus my intuition trades in which these stats gives a wealth of information about how I interacted with the markets on any given trading day. With that said, it's very important you remember that I'm constantly looking for ways to improve my own trading and the trading of my clients as a discretionary trader using a rule-base trade method (no automation, no program codes, no algorithms). What percentage of traders using your strategies are profitable ? Currently as of 2014, about 78% say YES and that number has been as low as 72% or as high as 83% depending upon which year (updated stats posted at TheStrategyLab.com home page). Further, of those that said YES...about 71% said they are exclusively using our strategies and nothing else while the remaining 29% used concepts from our methods to either improve their own methods or design new strategies that was more suitable to their trading style. The above info also shows that 22% has not seen an improvement in their trade performance although most believe it's too early to tell because they are still learning the strategies. Here's another interesting stat...we keep track of traders within our social network (forum, chat room, twitter group) regardless if they are using our methods or using their own methods. Traders not using our methods (don't have access)...only 19% are profitable and most of them have openly stated they do not trust vendors or may try our methods in the future only after they've exhausted their self-learning process. Is there a way to determine the potential performance level prior to purchasing the strategies ? First of all, this is an impossible question to answer because we do not know your learning curve, at home/work trading environment, trading tools you have access too, trading capital, trading experience and many other variables. Secondly, do not assume you will achieve similar like trading results as my results because I have +20 years of market experience and 15 years of that is via trading. Thus, we only advertise that we will improve your trading in comparison to your trading prior to you using our trade methodology. Also, due to my extensive market experience as a price action only trader...it's the main reason why the real-time support is extremely helpful for clients that want to collaborate with me in real-time during the trading day. Therefore, market experience has a big impact on my profit level, consistency and successful application of the strategies as it is for clients when I share the market experience. Simply, we do share with you our market experience via the support that's included with the purchase of our strategies. The above in any combination will have an impact on your performance level in comparison to another trader regardless if you use our strategies or strategies by someone else and it's what most vendors will not tell you about realities of trading. Why is it so difficult to find traders at other forums using your methods to get first hand knowledge about the merits of your strategies without having to request references from you ? 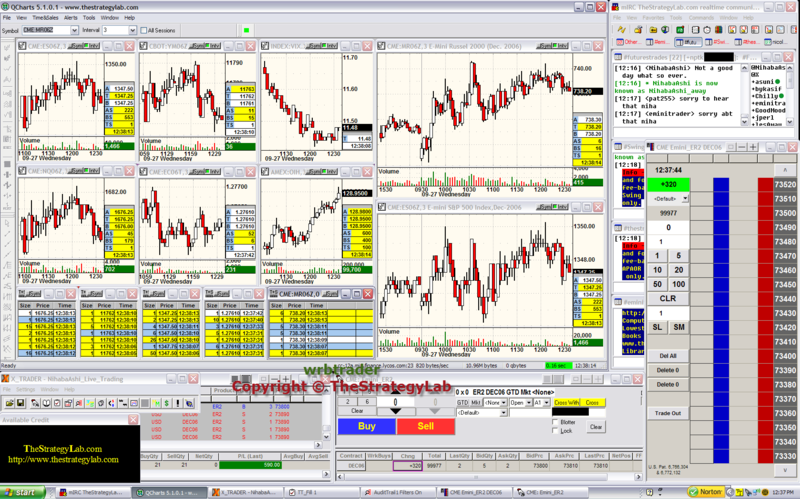 First of all, traders tend to find out about TheStrategyLab.com via search engine (e.g. Google), referral from another trader in their social network (e.g. Facebook) or via word of mouth (in person recommendation). Thus, we ourselves do not promote our services outside our website and if we see someone spamming (promoting our website without having been solicited for information) our website at another online resource such as a forum...we'll contact the site owner of the location where the spam was posted so that the info can be deleted. With that said, you can easily determine the merits of our trade method via using the below free resources. The above will allow you to determine on your own the merits of your trade methodology without needing references from other traders because you'll be able to interact with those "other traders" using our resources. In addition, your use of the above free resources will show us that you have a sincere interest in learning/applying our trade methods. You have a free chat room called ##TheStrategyLab where those using the room are posting their trades and price action analysis. You also said that some members using ##TheStrategyLab or register to use the room are not using your methods. The question is why do they not purchase your strategies when you post consistent profits most trading days along with a broker profit/loss statement ? Some ##TheStrategyLab members are profitable via their own methods merged with price action concepts from our free resources (e.g. WRB Analysis free study guide, free FVB trade signal strategy) and that reason alone is why they aren't interested in purchasing any of our advance methods. In addition, many members have already invested a lot of time & energy in their own methods and that in itself makes it very difficult for many to switch to our trade methods. Also, we don't market our strategies in real-time within ##TheStrategyLab chat room because it is a spam free chat room although we do some promotion within the archived chat log of ##TheStrategyLab posted at the support forum that's read by guest visitors. Simply, its common to have a member of ##TheStrategyLab not know we are vendors too. Why should I pay for your strategies when I can just join the free chat room called ##TheStrategyLab to mimic (copy) your trades as you post them in real-time ? ##TheStrategyLab is not a signal calling room nor is it properly setup for traders to efficiently mimic each other trades due to the fact that there are a lot of market discussions and trades being posted by many different room members at the same time (Long and Short). In addition, the odds aren't good that you'll get the same fill nor the same exits due to the fact that the chat room members do not give warnings when a trade (entry or exit) is about to occur along with the fact that my trades are posted among trades being posted by other members. Thus, the odds aren't very good you'll have the reaction skills to see my trade posted in real-time until its too late to mimic. Also, I have a strong belief that if you mimic trades by another trader without the permission of that trader...you'll instill poor trading habits that will be extremely difficult to fix when you do decide one day to learn how to trade on your own along with showing members of #TheStrategyLab that you're not interested in participating in the chat room via either posting trades or discussing the markets. Therefore, I don't recommend any trader to mimic the trades of another trader unless they have the exact same broker, trade execution platform, chart program, similar like chart layouts along with having access to the strategy being used to prevent blind trading. Further, I'm always trying new strategies (hence the name TheStrategyLab) to see if they are suitable for adding to my existing trading plan. Simply, it will be a huge mistake for you to mimic my trades without my permission and without knowledge of knowing if the trade signal is from my profitable system or from something that's new and possibly not reliable. However, I and other members do sometimes tell fee-based clients in the private ##VolatilityTradingTSL or ##WRB_Analysis real-time strategy discussion chat rooms about possible pending pattern signals or will discuss clues as they are occurring that a pattern signal may soon appear along with identifying key changes in supply/demand. Is there a reason why you don't post information with your real-time trades in the ##TheStrategyLab chat room involving your stops and profit targets ? The information about my trade management is posted in the available free information at the TSL Support Forum within the free Fading Volatility Breakout (FVB) trade signal strategy and other trade management information within my "daily trading routine" links you'll find in the performance record at the TSL Support Forum. Simply, I don't repeat the same information for every trade in real-time whenever I post a trade in the chat room when you can easily read my trade management information at the TSL Support Forum. Do you trade someone's else account besides your own trading account ? I'm not interested in trading the account of another individual because I'm well capitalized. In addition, trading my own account is stressful enough without having to worry about the money of someone else. In fact, some traders perform better when they trade the money of someone else. In contrast, I do not perform better when the money belongs to someone else or I know traders are trying to mimic (copy) my trades. Yeah, for me to say the above implies I've tried it and the results were not good and far too stressful. That's the thing about trading, you got to know your strengths and weaknesses and then exploit what you're good at while staying away from situations that you perform poorly. I'm interested in WRB Analysis for my exit strategy while not interested in WRB Analysis for my entry strategy because I am confident in my entries because they back-tested well and my real money trading results have profitable results. Simply, my problem involves exiting profitable trades too early. Thus, can your fee-based strategies help me with my exit strategy so that I can capture more profits from profitable trades ? We also encourage you to send us detailed charts of trades (good profits, poor profits and losers) with info about the entry/time of price, exit/time of price and basic info about your entry signal. We'll then reply with customized solutions based upon our WRB Analysis integrated with your trading style and methodology. Simply, every trader is different and having access to some basic information about your entry strategy with chart examples will allow us to design a customized profitable solution via our WRB Analysis for your exit strategy problems. Should I purchase the Advance Tutorial Chapters or the Volatility Trading Report (VTR) trade signal strategies even though I have not started trading ? Yes but only after your use of the WRB Analysis free study guide and you've maintain a statistical analysis of your trading with WRB Analysis versus your trading before you learned WRB Analysis. In fact, I may one day start a mentoring (coaching) program and one of the requirements for students prior to any mentoring is that I will request their statistical analysis results for review. Without their documentation, there will be no mentoring. With that said, its very common for traders to purchase our fee-base methods so that they can learn prior to opening a trading account after using WRB Analysis on a simulator. This allows them to build up confidence via understanding the strategies and the statistical analysis prior to any real-money trading.